Since 2003, Healy Consultants Group PLC has assisted our Clients with registering their offshore company in Guernsey. Our services include i) Guernsey business registration ii) licensing assistance in regulated industries iii) international corporate bank account opening iv) legal tax structuration strategies and v) virtual office solutions. Guernsey has excellent infrastructural facilities that enables the companies incorporated in the island to access the global markets and interact with a wide range of customers. The nation has recently invested US$1.3 billion and developed a data centre having 7 fibre optic cables which connects the country with UK and France. Guernsey has a small population of 62,063 people, as per 2017. As a result, it is challenging for employers to expand their business locally or launch and test new products in this extremely small market. Moreover, it would be tough for employers to hire skilled labour force in areas other than finance, business, administration and IT services. For the reasons listed above, Guernsey’s compliance standards are well regarded, as demonstrated by its rank as the 15th most cooperative offshore jurisdiction (out of 83) by the Tax Justice Network. To help us engineer the optimum Guernsey corporate structure, please complete the 3-minute questionnaire below; then press the submit button below. How long does it take to incorporate a Guernsey company? Registering an Guernsey company is time-consuming and will take about 2 months. Am I required to visit Guernsey to incorporate a company there? No. Healy Consultants can legally incorporate your Guernsey company without you needing to travel. What is the minimum number of directors required for a Guernsey company? Under statutory regulations, a Guernsey company requires a minimum of one director. A Guernsey company does not require a resident director. What is the minimum number of shareholders required for a Guernsey company? A minimum of two shareholders is required. 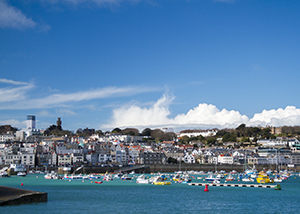 For a Guernsey exempt company, resident cannot hold shares in the company. What are the minimum capital requirements for a Guernsey company? No. minimum capital requirements is needed for a Guernsey company formation. Is a Guernsey company required to submit financial statements? A Guernsey company is obliged to file an annual return and accounts have to be audited. What other requirements need to be fulfilled to set up a Guernsey company? A Guernsey company is required to appoint an auditor unless it qualifies for exemption. What are the tax implications of a Guernsey company formation? A Guernsey exempt company pays no corporate tax on income sourced outside Guernsey. In order to qualify as an exempt company, an annual fee of US$1,200 is payable to the government of Guernsey. A Guernsey resident company pays a corporation tax of 20% on all income.